This year, though, to quote The King, I'm all shook up. I stopped and paused for a second, but not because my affection for Lisa Marie's daddy has grown any stronger. Nope -- it's because I just remembered that Elvis died when he was 42, the same number of candles that were on my cake this year. 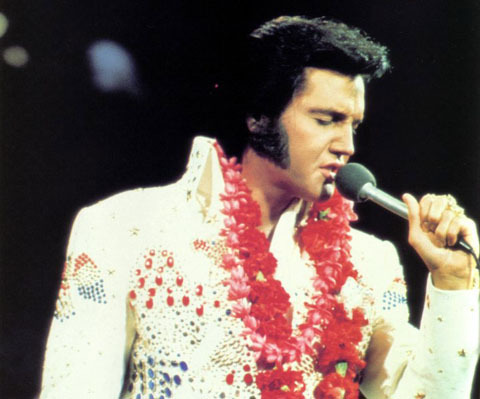 Not sure why, but the fact that I'm now older than Elvis was when he died is a mortality milestone for me, a reminder that as time goes by, I'm -- and we're all, of course -- getting that much closer to leaving the building. Same thing happened when I hit 29, which a Superman writer once claimed was the Man of Steel's constant age, and when I turned 33, the same age a carpenter from Nazareth was when he met his maker. Or every time I talk with a doctor who looks like he's 12. So, even though this year your birthday is a little more jarring than most, thanks for that reminder, King. Thank you very much. As for age milestones, one that struck me was the first time I had a boss who was younger than me. I felt that way too when I outlived Elvis and John Lennon. It's a weird feeling to be older than the age of the older people you've looked up to all your life. I'll be 50 in September, but have been thinking of myself as 50 since I turned 49 so hopefully it won't hit me so hard when the time comes. Hope it works - LOL! !